We appreciate you taking the time to visit our site and learn more about us. Actually there is not much to learn other than the fact all of our in-house software is developed my young people ranging from 14 to 18 years old. 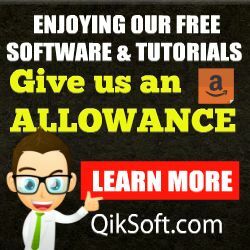 Most of the young people involved with QikSoft are wishing to learn about marketing on the internet and of course, learning how to create software. At this point we are only focusing on Windows software but, MAC versions are in the works. The main focus at this point is learning how to work as a group and develop stable software for Windows. Once our leadership is satisfied that the group can work as a team, we will then move on to other platforms. Please take the time to subscribe via our newsletter or click the “bell” at bottom of page to be notified when we update this site with free software, tutorials and related news. QikSoft Members Get $20 Credit!